Large town in the west of England, dating back to Roman times. The earliest date mentioned in connection with the Jews of Gloucester is 1168, when an alleged ritual murder of a boy named Harold was charged against them ("Hist. S. Petri Glocestriæ," ed. Hart, i. 20). The leading Jews of that period were Moses le Riche, Elias de Glocestre, and "Hakelot." A contemporary was Josce, who was fined heavily by the king for financing Strongbow's expedition to Ireland (1171). The community appears to have prospered until the exactions of John began, when their situation became critical. In 1217 a special royal order was issued guaranteeing to them immunity from oppression. 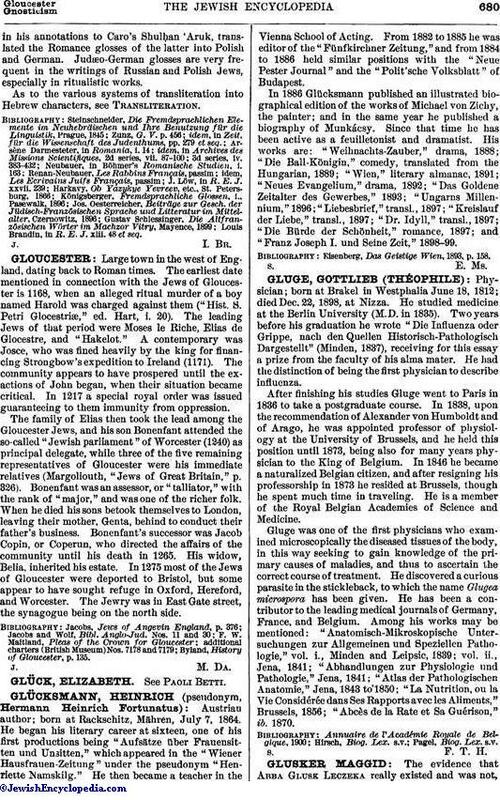 The family of Elias then took the lead among the Gloucester Jews, and his son Bonenfant attended the so-called "Jewish parliament" of Worcester (1240) as principal delegate, while three of the five remaining representatives of Gloucester were his immediate relatives (Margoliouth, "Jews of Great Britain," p. 326). Bonenfant was an assessor, or "talliator," with the rank of "major," and was one of the richer folk. When he died his sons betook themselves to London, leaving their mother, Genta, behind to conduct their father's business. Bonenfant's successor was Jacob Copin, or Coperun, who directed the affairs of the community until his death in 1265. His widow, Belia, inherited his estate. In 1275 most of the Jews of Gloucester were deported to Bristol, but some appear to have sought refuge in Oxford, Hereford, and Worcester. The Jewry was in East Gate street, the synagogue being on the north side. Byland, History of Gloucester, p. 135.